This photo of my daughter, taken almost exactly a year ago, rotates regularly through my computer's screensaver. It's a cute enough picture, but mainly it's a reminder to me that my kids learn best when I don't push it too hard. The night before the photo was taken, I had stayed up late and made a special alphabet set-up on the kids' play table. Streamers divided the play space into four long rectangles, each devoted to a letter. I filled the spaces with everyday items that started with the letter in question: a block, a ball, and a bus for the letter B; carrots and cars for the letter C; and so on. Nini went straight for the letter-A apple and bit right into it; I don't believe she even noticed the letters, and I'm certain she attached no particular significance to them. Desmond, when he bestirred himself from bed, merrily rolled the little cars along the streamer dividers, squawking with joy at the cool racetrack Mommy had made. My kids were not quite two years old, and not nearly ready to grasp the concept I was trying so hard to illustrate. 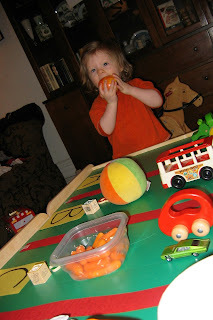 Certainly it wasn't a bad thing that I set up this little table -- the kids had fun with it, in their own way. But it wasn't necessary. I was trying too hard. It's only now, a year later, that they're starting to ask me what letter various words begin with. In between, I learned a lot of things: that quizzing them about their knowledge of the alphabet only made them tense up; that when they were ready and felt unpressured, they eagerly started pointing out letters on their own, and asking about the ones they didn't know; and that the best way to introduce them to new and challenging things is to pay careful attention to their interests, desire, and pace. I am so glad I found your site and this post. I am a mother of a 2.5 yr old active boy who is already getting individualized attention for his hyperactivity. So that and a 2.5 yr olds attention span doesnt lend itself all to well for "LESSON PLANS"